The Cod Beck Reservoir site, close to the village of Osmotherley, is one of Froglife‘s top ten toad breeding sites in the UK. The aim of the Osmotherley Toad Patrol every February/March/April is to make sure as many toads as possible get safely across the nearby main road and to and from the Reservoir. Question: What has been the impact of toad patrols on the population of toads around Cod Beck Reservoir? Conclusive evidence cannot be drawn, one way or the other, from the available data. There are just too many other variables* to consider. 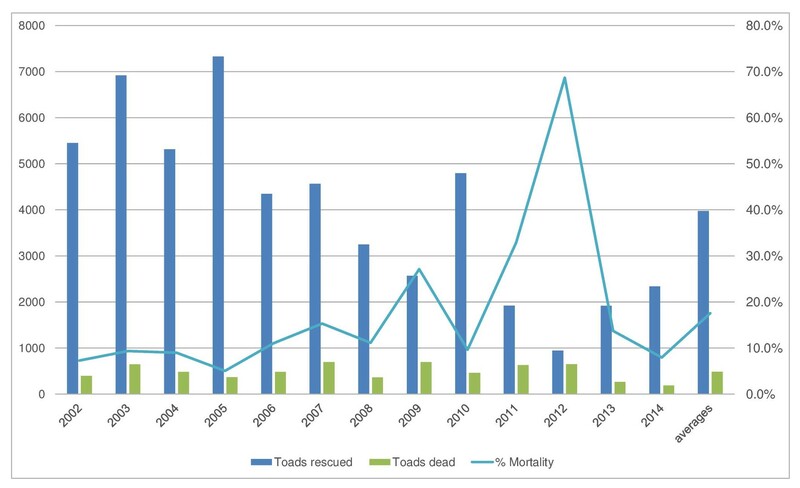 There were significant increases in toad numbers for 2002-2003 (when the organised patrols started), 2004-2005 and 2009-2010 but whether these were due to the patrolling …. Steve cannot say. The best year for numbers so far was 2005. However it’s difficult to envisage how toad patrols could conceivably damage toad breeding success. Steve and others believe that toads migrate quite large distances, maybe over several days, across the North York Moors from their summer residences/hibernation sites. The patrols only work on the road side of the reservoir and it is quite possible that similar numbers come directly off the Moors or out of the moor edge woodland on the non-road side. The patrols are helping the toads move the few final hazardous – because of the unnatural predation by vehicles – metres to enter (or exit) the water. In addition, the patrols are helping to bring males and females into contact ready to breed by collecting them in numbers in their transport buckets. As for other amphibians…frog numbers have been declining significantly both nationally and locally, possibly due to disease – “red leg” (Bacillus hydrophilus fuscus) and Chytrid fungus (Batrachochytrium). The patrols have not seen direct evidence of either disease, except possibly one or two specimens. However, frogs are moving before toads and the toad patrols really get going, in the coldest wettest nights of late February, so can’t report with any certainty on the frequency of frog disease. The patrols sometimes come across newts, probably Palmate. Numbers of newts have fluctuated greatly and may also have been affected more recently by Chytrid. The trends in toad numbers are difficult to assess because of the multiple variables involved. Over the last 10 years or so patrols have experienced a series of very cold, often dry spring conditions. Toads generally do not move if the temperature is below about 8C (though if it has been warm during the day they may move briefly at dusk with the temperature as low as 4 or 5 C). 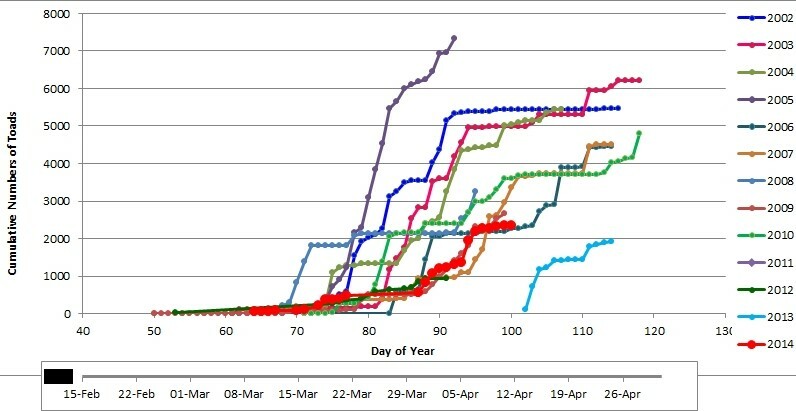 During a “normal” spring this threshold is reached around mid-March. What has happened in several years is that migration has begun in a brief period during mid-March but then the weather has turned colder for several weeks and stopped any movement. This makes it very difficult to forecast when it will be worth patrolling and, indeed, to keep volunteers motivated. Extreme cold conditions prevailed in 2013 when temperatures did not become suitable for migration until mid-April. A further feature worth noting is that, when toad migration has been inhibited by low temperatures for several weeks, movements also occur during daylight hours when it has been warmer. Of course, with higher traffic volumes during the day when people like toads come out to enjoy the warmth the numbers of toad casualties are greatly increased (e.g. 2007, 2011 and 2012). In 2005 – the best year – there was a consistently mild spring and all movements took place over a couple of weeks. 2001 The pernicious outbreak of Foot and Mouth disease lead to complete closure of the road during the toad migration period. This was obviously good for toads, and may explain why the start of formal patrols in 2002 found large numbers. 2004 A large wild fire in March on National Trust moorland (to the west of the reservoir) led to the inevitable discovery of incinerated toads. This may explain the drop in numbers compared with the previous year, though the following year (2005) was an all-time peak (7,325 toads). 2009 A major emergency services rescue operation occurred in April. The night was mild and wet encouraging toad movement. The number of vehicles involved unfortunately led to a high level of accidental mortality amongst the toads. 2011 onwards – Cod Beck Reservoir (Yorkshire Water owned) was partly drained in order to carry out maintenance work on the dam. Water levels were several metres lower than normal and it is supposed that this greatly affected breeding success as toads breed in deep water. The following year was the absolute nadir in toad numbers being a factor of 2 lower than any other year. Numbers have not recovered to pre-2011 levels since. There is some uncertainty around the future of the Reservoir and therefore the future of this toad breeding site. The patrols out of Osmotherley will be setting forth again in the next few weeks – all volunteers are welcome. Click here to sign up. An information evening for those interested in helping out with the Osmotherley Toad Patrol is being held at the Queen Catherine Hotel in Osmotherley on Wednesday 18 February at 7.30 pm. This entry was posted in Biodiversity, Conservation, Ecology, Environment, Local Community, Natural Environment, North York Moors and tagged Amphibians, Cod Beck Reservoir, Osmotherley, Survey, Volunteers, Wildlife by North York Moors National Park. Bookmark the permalink. Here’s a link to a blog post by an enthused toad volunteer earlier this month – http://yearofnature.blogspot.co.uk/2015/04/day-155-terrific-toad-patrol.html . No one is ever too young or too old to help an amphibian.